Semester-long promotion to drive account openings, awareness at Carolina Collegiate FCU. 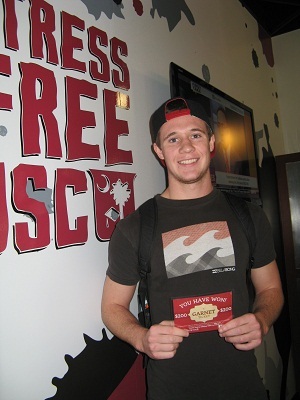 Cole Miller with his Garnet Ticket he found in a copy of The Daily Gamecock student newspaper. The $76 million, 13,500-member Carolina Collegiate Federal Credit Union partnered with The Daily Gamecock student newspaper at the University of South Carolina for a 13-week promotion called The Garnet Ticket, based loosely on the Golden Ticket in “Willy Wonka and the Chocolate Factory.” Through the fall semester at the Columbia, S.C., campus a “Garnet Ticket” was placed in one of the 50,000 daily newspapers delivered each week. Whoever found the ticket won cash prizes from Carolina Collegiate and prizes from other sponsors.